Geek, Nerd or Dweeb? : One tiring but nice weekend. 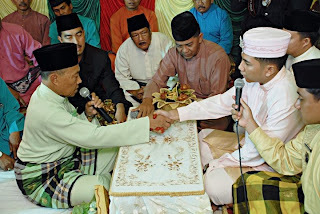 I've just got back from Tanjung Pinang, Indonesia, going there with my cousin, Hafizh, attending a relative's wedding. The relative was once the member of DPR of Indonesia and I guess that he would be doing his daughter's wedding not in a small scale. I asked him, how many would be coming. He told me he invited almost 4000 people. What? 4000? In Malaysia, a 1000 guest is already a headache. Anyway, on that particular wedding day, I guess the guest is not even 4k but maybe more. I guessed it maybe around 8k to 10k, based on what I was seeing that day. So, a photographer like me will of course get really interested to shoot. I've been to one wedding in Tg. Pinang and it was colourful! I bet this one would be doubly colourful. The wedding in Tanjung Pinang is of course, more 'Malayish' that what we are having. 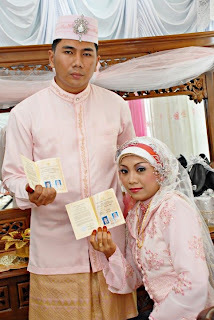 I bet Malaysian Wedding are a lot simpler and for some people the wedding processes should not be getting more complicated as the process of pre-marriage is already a burden and hassleful. As I arrived there, the mom of the bride had asked me to shoot some photos as the assigned photographers is not there yet. The wedding is started with the 'berandam' or 'bercukur' ceremony. 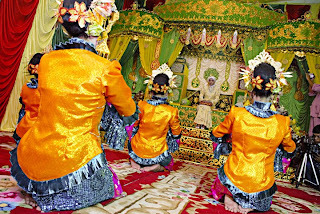 It's a ritual that signing the initiation of the 'Berandam' proses. The process was just a mere shaving of the hairs here and there. It's a lil bit orthodox. The room was a bit dark so I decided to use the CLS for this picture. Nothing to be proud of, I mean the cls but good enough to light the room for that shot. Then, we went to a relative's place and stayed there until 8 PM for the next occasion, which is called berinai. 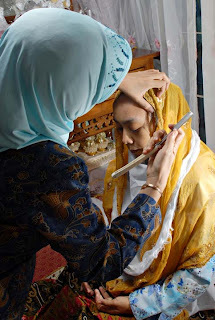 In Malaysia, the so called berinai night has got nothing to do with 'Berinai', of which to apply henna powder to the fingers and toes, purposely to decorate the bride's fingers and toes. 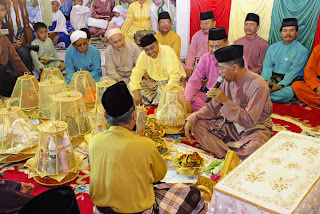 In Malaysia, the berinai night is done before the solemnization. In Tg. Pinang, it's done the night before the solemnization. More special, the occasion does include special dances of which later the dancers will invite the members of the floor (I mean the guests) to come and dance with them. One guest after another will do the 'menepung tawar'. The Master of the Ceremony will call them up one by one. Once finished, the father of the bride recites the Doa and the bride will later brought down and will be asked to lay down on a matress. The mak andam and someone else will apply the henna powder. Once finished, the bride will be asked to stay on that matress all the way, till the henna is dried. Then I actually went back home as it's getting really late then. Early morning the day after, I woke up early just to get all battery to be properly charged. As I have only one battery for my Nikon D200, I have to make sure it's fully charged everytime before a job or an assignment. There's already a lot of people coming when I arrived there. Inside of the house, people has already gathered to witness the solemnization. The most beautiful thing about the wedding in Tanjung Pinang is that, every conversation is done by rhyming the sentences. The malays call it, 'Pantun'. It is very surprising that these people can really Berpantun like nobody's business. There's no single thing that is not being rhymed in the pantun form. The solemnization aqad was successfully completed only at one attempt. The father of the bride wishes to execute the aqad himself. After the aqad, the groom went into the room on the bride to present the dowry to the bride himself. Then the ceremony proceed as usual. There are more dances. More people coming till 7PM and I left at around 7730PM to check in to the hotel and get my rest. The bersiram Occassion is on the next day of which I didn't attend as I was rushing back to Malaysia. I guess it's gonna be much more fun. Everybody has got to get wet!